The Hebrews learned from the Phenicians the art of erecting large buildings having several rooms. David's palace was built by workmen sent by Hiram of Tyre; and Solomon also availed himself of their services. Of David's palace no details are known, except that it stood in the City of David, and thus was situated on the southern slope of Zion, the eastern hill. Farther up this hill, to the north of this building, Solomon afterward erected his palace, an extensive structure which enclosed within its walls not only the king's mansion, but also the Temple and other edifices. The site of this palace corresponds in all probability to the southern part of the present Ḥaram al-Sharif. The main entrance was from the south. 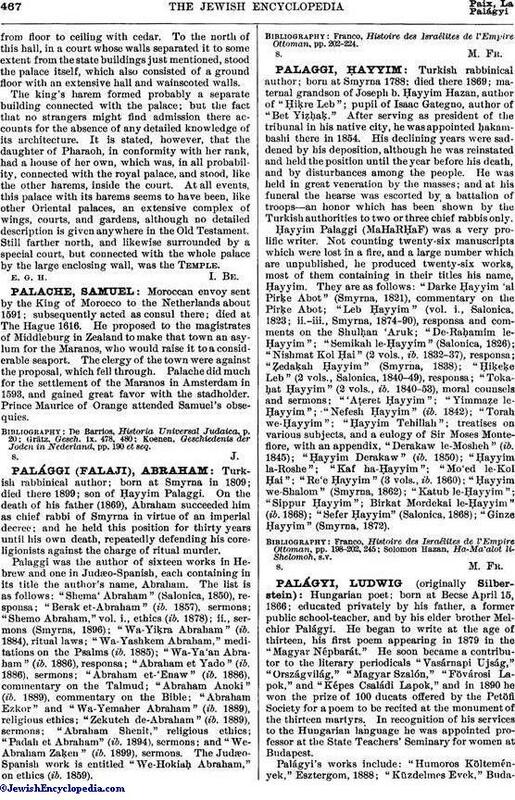 It may be assumed that the description of the palace, found in I Kings vii. 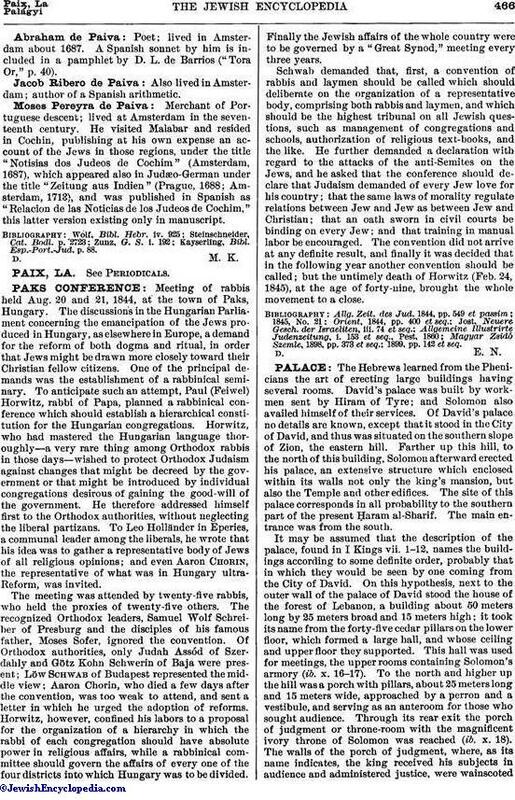 1-12, names the buildings according to some definite order, probably that in which they would be seen by one coming from the City of David. On this hypothesis, next to the outer wall of the palace of David stood the house of the forest of Lebanon, a building about 50 meters long by 25 meters broad and 15 meters high; it took its name from the forty-five cedar pillars on the lower floor, which formed a large hall, and whose ceiling and upper floor they supported. This hall was used for meetings, the upper rooms containing Solomon's armory (ib. x. 16-17). To the north and higher up the hill was a porch with pillars, about 25 meters long and 15 meters wide, approached by a perron and a vestibule, and serving as an anteroom for those who sought audience. Through its rear exit the porch of judgment or throne-room with the magnificent ivory throne of Solomon was reached (ib. x. 18). The walls of the porch of judgment, where, as its name indicates, the king received his subjects in audience and administered justice, were wainscotedfrom floor to ceiling with cedar. To the north of this hall, in a court whose walls separated it to some extent from the state buildings just mentioned, stood the palace itself, which also consisted of a ground floor with an extensive hall and wainscoted walls. The king's harem formed probably a separate building connected with the palace; but the fact that no strangers might find admission there accounts for the absence of any detailed knowledge of its architecture. It is stated, however, that the daughter of Pharaoh, in conformity with her rank, had a house of her own, which was, in all probability, connected with the royal palace, and stood, like the other harems, inside the court. At all events, this palace with its harems seems to have been, like other Oriental palaces, an extensive complex of wings, courts, and gardens, although no detailed description is given anywhere in the Old Testament. Still farther north, and likewise surrounded by a special court, but connected with the whole palace by the large enclosing wall, was the Temple.